“The chief forms of beauty are order and symmetry and definiteness, and these are especially manifest in the mathematical sciences” (τοῦ δὲ καλοῦ μέγιστα εἴδη τάξις καὶ συμμετρία καὶ τὸ ὡρισμένον, ἃ μάλιστα δεικνύουσιν αἱ μαθηματικαὶ ἐπιστῆμαι) – Aristotle, Metaphysics, Book 13 (Mu), Section 3, my translation. “Symmetry, as wide or as narrow as you may define its meaning, is one idea by which man through the ages has tried to comprehend and create order, beauty and perfection” – Hermann Weyl, Symmetry, 1952, Princeton University Press, p. 5. “Regularity is successive symmetry; there is no reason, therefore, to be astonished that the forms of equilibrium are often symmetrical and regular” – Ernst Mach, The Science Of Mechanics, 1919 edition, p. 395. 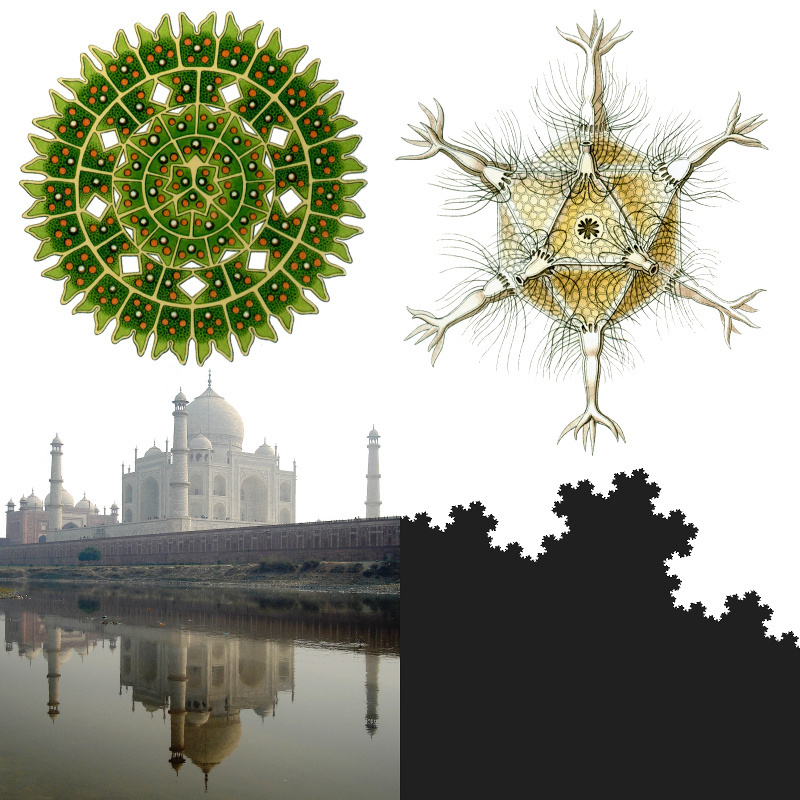 Bottom left image derived from a public domain photo by Vinoo202. See also this blog post, and my previous post about CIRCOS diagrams. ‘Use your imagination, man. Consider the top of the first cube in relation to the top of the second; that’s cube number three. Then the two bottom squares, then the front faces of each cube, the back faces, the right hand, the left hand—eight cubes.’ He pointed them out. 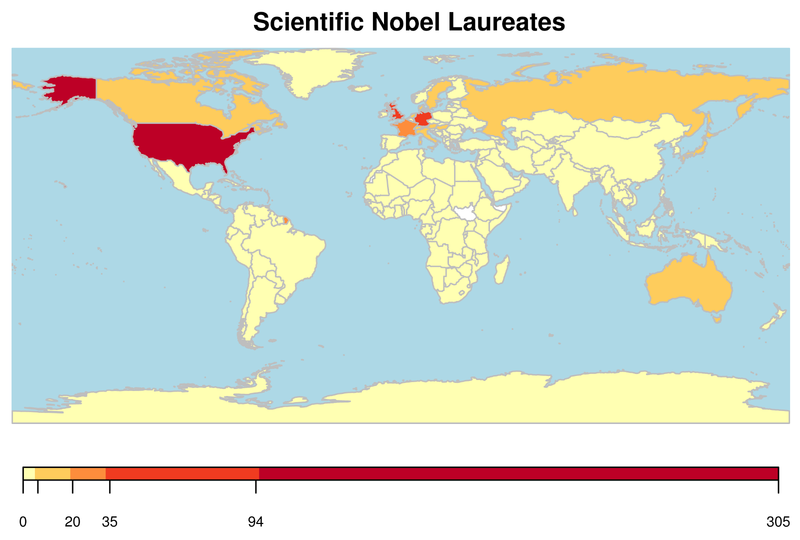 I was looking at the list of scientific Nobels on Wikipedia. 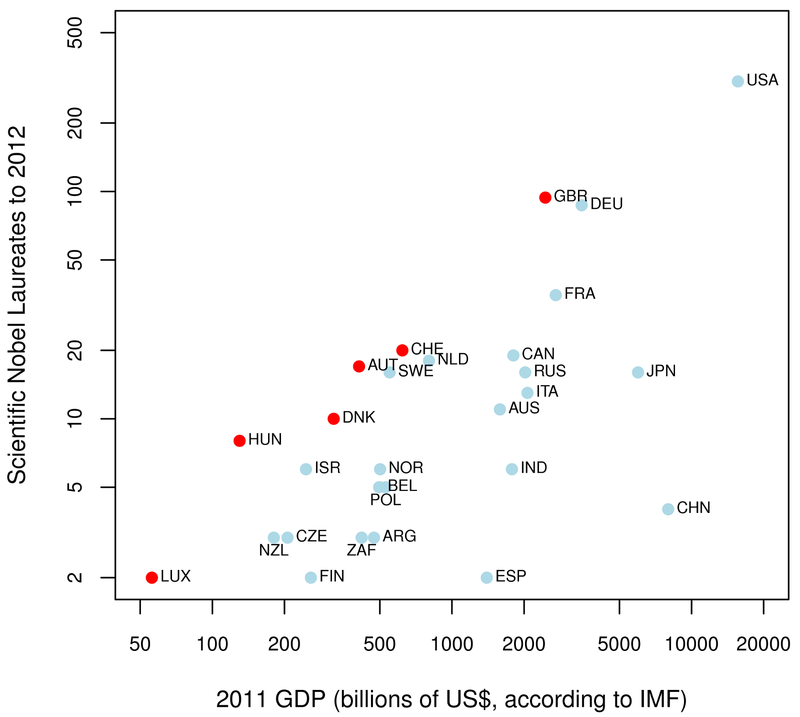 A good predictor (correlation 0.84) of the number of Nobels for a country is the size of the economy (the GDP). Population size has, surprisingly, a small negative effect. Some countries do significantly better than predicted by GDP: Luxembourg (2), Hungary (8), Denmark (10), Austria (17), Switzerland (20), and Great Britain (94). What did they do right? 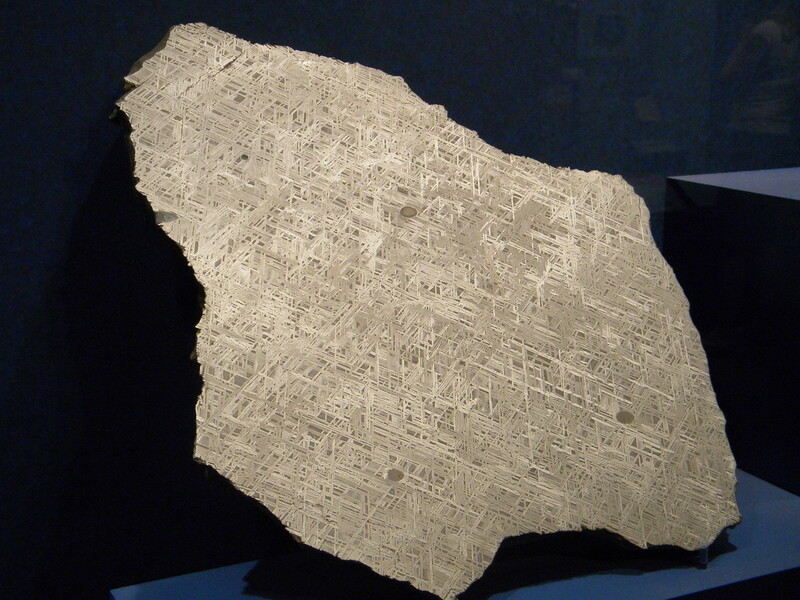 Many of the earliest objects made from iron were forged from iron meteorites. The dagger above and the hatchet below are later examples. Working with meteoric iron could be done in the absence of iron ore, or in the absence of smelting technology. A recent paper in the Journal of Archaeological Science reports that the oldest known iron artefacts (iron beads from Egypt, dated to 3200 BC) were made from meteoritic iron, rather than being smelted from ore (the presence of germanium is the strongest evidence). This indicates that the age of iron began with meteorites from the sky, and that the smelting of ore followed centuries of experience with meteoric iron. Iron smelting may be technologically more sophisticated, but making iron blades from star-stones is far cooler! A very welcome step! Volume 1, issue 01 was April 2013, and is still online.